Rains Electric Company is a full-service electrical contractor serving commercial customers. 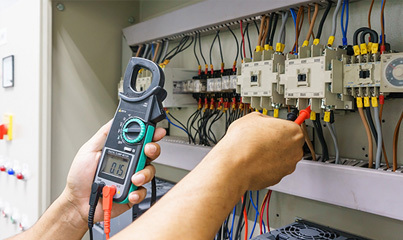 We provide electrical contractor services, rock drilling and other services for the Madison area. We work with new constructions, renovations, tenant improvements, service upgrades, exterior, interior and landscape lighting, retrofits and service installations. Rains Electric Company has served its customers in the Nashville, Hendersonville, Franklin area with a commitment to service and value. We have the experience and expertise to get the job done right the first time. Our skilled professionals use only the finest tools and materials. Once we've made the necessary repairs, it's almost as though the damage never occurred! Our service is personalized and our prices are affordable. From design to finish, our professional estimators, project managers and technicians provide the expertise to ensure your electrical project is completed on time, on budget and up to code. We understand that service interruptions are an inconvenience and cost you productivity, so we focus on providing expedient services to get you back online as soon as possible. We are also absolutely committed to safety and provide ongoing education to our personnel to ensure complete compliance with best practices and standards. If there's anything else we can do to make your experience any better, contact us today! We appreciate your interest and look forward to earning your business.